Published on March 13, 2009 by Wade Shepard Follow me on Twitter here. This is the future of drinking water for the entire world. No longer will you be able to pour yourself a glass of water from the tap and drink it down. Rather, it will soon become convention to have a delivery service drop off these 10 gallon jugs of bottled water to your home. Bottled water will soon become a rule, rather than a luxury. Bottled water will soon be sold to everybody, and not just the tidy elite who balk at health consciousness. Purified factory water will soon become a global standard, much as municipal tap water is for us today. Bottled water is already the unquestionable rule in Turkey. 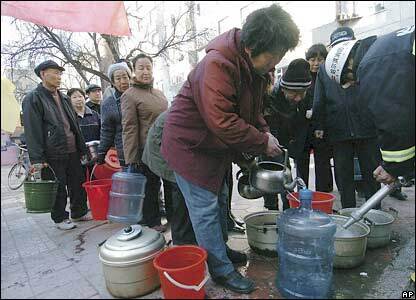 Few people will even think of drinking water from the tap, or even of boiling the tap water. Paying for water had become the convention. Once something becomes a convention, there is no going back. This photo is from Honduras, another country where bottled water has become conventional. Private companies have usurped the rule of municipalities when it comes to supplying drinking water in many countries. And it is my impression that the municipalities heaved a big sigh of relief: for they no longer need to fill the responsibility of supplying clean, safe drinking water to their constitutes. The private companies have jumped the gun and claimed for themselves one of humanity’s basic needs. This photo is of bottle water being delivered to a home in Turkey. When the people need water here, they call a delivery service and a new 10 gallon jug is brought to their homes within minutes. Whenever you need a drink, you will now have to pay for it. Drinking water will no longer be a disposable, never ending commodity, and the companies will dictate its price – for better . . . or for worse. 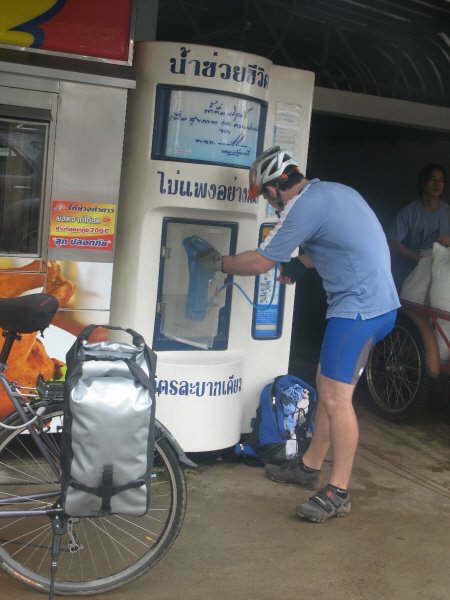 Photo from Bicycle Luke of a purified water machine in Thailand. These machines are now strewn about the country in a manner that is similar to how community wells were once distributed through various population centers. People now beginning to come to these modern “wells” to pay for their drinking water. Photo from Myanmar Times of a bottled water factory that produces drinking water for Australia. 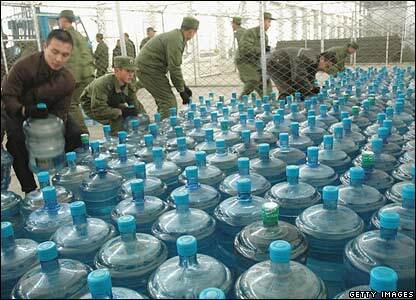 Photo from BBC News of bottled water in China. The people here generally take their water from a community tap that disperses free preboiled drinking water. I now predict that within the next ten years these community taps will only disperse bottled water that needs to be paid for, or that people will order these 10 gallon jugs to be delivered to their homes. Well water was the new river water, municipal tap water was the new well water, bottled water is the new tap water. What are you going to do when the bottled water is too polluted to drink? i think make a new water factory in Syria , but i don’t know haw and i don’t have any idea about machiens ..
I’m from kosovo In my back home i have a land which natural watter come out from the land. So I’m interesting to make a Watter factory,any one from supplier who has those machines let me know by email.